Tony Hawk's Pro Skater 4 (PS2) Review - Game Reviews | Squackle.com! The Funniest Site on the Net! For those who have not played any of the Tony Hawk’s Pro Skater games don’t waste your time with any except Tony Hawk’s Pro Skater 4. THPS 4 has all the improvements from its three predecessors, but this time there is no time limit involved in skating sessions. Basically, it’s free-skate all the time. The whole premise of THPS 4, is to complete particular challenges given to you by zany characters and other skaters you will come across in a particular level. 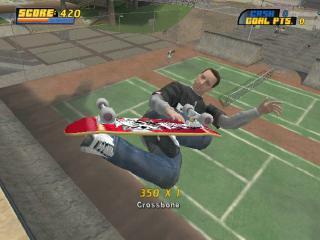 THPS 4 features nine pre-made maps, two of which must be unlocked through excessive gameplay. You’re given the chance to skate at a college campus, San Francisco, Chicago, a shipyard, or even a zoo. On each of the maps you’ll find one or two mini-games. The extra challenges help you learn advanced tricks so that you can use them on your own free skate time. With THPS 4, you can make your own skate park and create your own skater with even more items to customize. When you create a skater, you can make your skater short and fat, tall and fat, or just plain fat. A lot of the modifications are not that realistic, but its still fun to mess around with. Speaking of realism, if you’re planning on beating this game, you’re going to have to do tricks that are basically impossible to do in real life (like launching off a ramp, doing four varial heelflips, then doing a manual as soon as you hit the ground). The gameplay will take a while to master if you are not a Tony Hawk veteran. The game is all about timing and getting used to the in-game physics, as well as getting used to your particular skater’s trick outfit. Tricks are basically split up into four different types: Grab tricks, Flip tricks, Grind/Lip tricks, and the newest addition, Flatland tricks. Grab tricks are tricks that are made while in the air. Flip tricks are also made while in the air, but can be executed a lot faster than a Grab trick. Grinds are made on rails or edges of a sidewalk. Lip tricks also make use of grind-able surfaces; they must be at the top of a half-pipe or on the edge of a bowl or similar surface. Flatland tricks are made while on the ground, and require nothing more than balance, exactly like a grind. Flatland tricks are new to the series with THPS 4, as they all stem out from the manual. Through the series, manuals have become more and more important, allowing you to string together tricks one after another. The developer has been able to take advantage of Flatland tricks and put together some fairly challenging situations throughout the game. It may take you a day or two just to complete one particular challenge, if you have the patience enough to actually do so. You advance through the game by gaining Pro Points and Cash. The more Pro Points you have, the more levels you’ll have access to. The more Cash you have, the more extras you’ll be able to play around with, such as cheats, movies, skateboard decks and more things to customize your create-a-skater with. You have to spend your points carefully, as time goes on it’ll be harder to get more points. The multiplayer aspect of this game was a HUGE part of the game. Before they took it down, it may have even be more important than the single player mode, because nothing was more fun than snubbing your five billion point score in other people’s faces when you’re declared the winner. While the network play option has become easy to configure with THPS 4, it really doesn’t matter anymore since the online portion of the game is no longer supported. Not until you play a Tony Hawk game online do you know how good you are compared to other people — you could have completed all the challenges in the single player mode, but still get wiped on the floor. It’s really a shock to see people reaching scores of 3 million, 5 million, or even 10 million plus. When online was active, all of the offline multiplayer games were available for online play. However, as with any online game, the better your internet connection, the better the game play. Also, having a keyboard helped when communicating with other players. Sadly, all this is for naught as THPS4’s online is down for good – you’ll have to play split screen multiplayer nowadays if you still stick with this version of the Tony Hawk series. The graphics in THPS 4 are still pretty good. Compared to the previous games, everything in the game has been given the extra effort in being polished. There aren’t too many frame rates drops, unless you’re racking up points that are literally in the millions for just one string of tricks, because the calculating of the numbers can slow the game down. They’re good graphics, no more, no less. Each level is detailed very well and full of unique objects you’ll only see on that particular map. There are also unlockables in which you see the actual skaters doing tricks in compressed skateboard videos. Like the other games in the series, THPS 4 also has an impressive soundtrack by a mix of rap/hip hop artists (NWA), punk bands (Offspring), and even a little bit of the classic rock (AC/DC, the Cult) and classic heavy metal (Iron Maiden). If you don’t like a particular song, you can easily stop it from playing ever again. There’s also voice acting for the people that give you challenges. It isn’t all too bad, but in the case of some characters like Ollie the Bum, you’ll either love it or hate it. With a Greatest Hits price of $19.99 or even cheaper these days, Tony Hawk’s Pro Skater 4 is well worth an investment when it comes to skateboarding games. 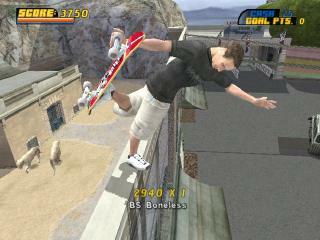 The THPS series has always been the best games of their particular genre, compared to other “extreme sports” games. In my mind, Tony Hawk’s Pro Skater 4 is the perfect skateboarding game that encompasses all of the best things from the series before they went in a new direction with the Underground series. There hasn’t been another “Pro Skater” title since. The value of the game has been diminished since the shutting down of the online servers, and it will be missed by the few who still held this game as the pinnacle of the series.